An entire world of hypnotism, with others who also possess this ability opens up before Jax. A well-respected Institute run by one Elias Mako and a Guild presided over by a decidedly less imposing-looking Axel Braintree each pull Jax in different directions, each giving him reasons not to trust the other. The first quarter and last half of the book are full of fast-paced action sequences that truly keep the reader on the edge of his seat. The second quarter of the story has a more sedentary focus in that it involves more of Jax’s training at the Institute and his own realizations about the possibilities and responsibilities of his newly discovered ability. 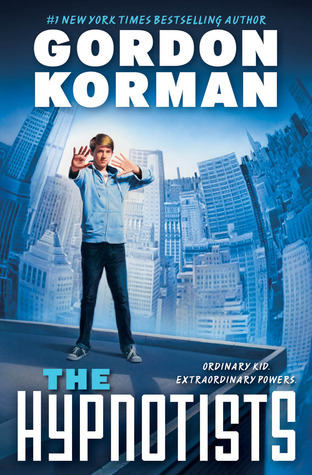 I appreciate the fact that here Korman introduces an ethical dilemma faced by those with the hypnotic ability. The genius of this aspect of the story is twofold: (1) it deepens the development of Jax’s character while starkly outlining the ‘good’ versus ‘evil’ of his two primary mentors; and (2) as a reader you find the thought sneaking into your brain–“what if? What if this ability actually exists?” Having begun to establish even minor doubt in the reader’s mind makes Jax’s heightened emotions and the somewhat contrived situation with the presidential ramifications feel more believeable. The Hypnotists will lead you on an exciting adventure…if you allow the characters to lead you. I am looking forward to seeing the direction both the characters and the series take as it grows!